Joint List MKs block road in protest against enforcement against illegal construction by Bedouin in south, despite compensation offer. MKs from the Joint Arab List took part in a protest blocking Route 40 Thursday morning. 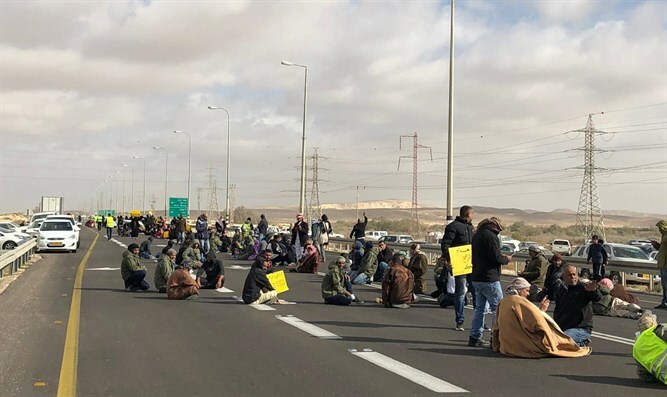 The demonstrators protested against the State's enforcement against illegal construction by Bedouin families near Kibbutz Revivim, and accused the State of failing to provide alternative housing for the residents who would lose their homes. However, the arguments of the protesting MKs are completely false, according to the Regavim organization. Hundreds of illegal structures are located on state and privately owned land, to which families from the Al Azazma tribe invaded in 1995. In 2003, the state established for them a legal town called Bir Hadaj, in which huge sums were invested for the development of plots for construction, planning the town and preparing infrastructure for its residents. The town has a valid outline plan that allows for legal construction. In a recent petition submitted by Regavim and the legal land owners to the Be'er Sheva District Court, it became clear that in recent years the State has offered the squatters unprecedented compensation in order to agree to a permanent settlement: a plot of five dunams (1.2 acres), alongside a grant of NIS 250,000 ($66,500) to each family. However, they refused the State's remained in the territory they invaded. Last year, the head of the Bedouin Settlement Authority, Yair Maayan, declared that "in light of the lack of cooperation on the part of the residents and their unwillingness to reach an agreement, the authority's regulatory activity has ended." "The Arab MKs do not get confused by the facts, and lie brazenly when the facts are completely different," says Amichai Yogev, the director of the Regavim movement in the south. "The Arab MKs prefer that the Bedouin live in illegal shacks, instead of in an orderly settlement with infrastructure, public buildings, and welfare and education services, so that they can continue to blame the state and make political capital on the backs of others."